Montessori Candy: What's for Lunch? I'm going to try my best to pre-make each days lunches with the ideas from Laptop Lunches, so that lunch break is actually a break and not hectic for us. The nice thing about lunch this way is that the children can help. Tonight, my 7 year old cut fresh green beans for us and placed them in a Rubbermaid container for easy lunch assembly later. 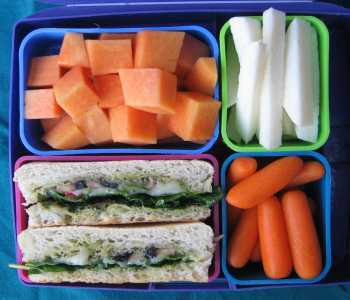 For Montessori lunch making, you could even layout all of the pre-cut ingredients for a lot of these lunches and have the children assemble their own lunches by looking at a printed picture from the website. For correct nutritional portions, you could have 1 cup, 1/2 cup, etc.. measuring scoops in each ingredients container. I found correct portion sizes listed on the Laptop Lunches website and printed them out so I could start learning what they are. I noticed that most, (if not all) of the Laptop Lunches pictured were meatless. As Catholics, we keep the custom of not eating meat on Fridays and of course there are days throughout the Liturgical year that call for fast and abstinence. I found this to be a great added bonus! Besides the Laptop Lunches website, there is also a Laptop Lunches Flickr group where you can find more inspirational ideas for both kid and adult lunches. Please feel free to leave comments and share if you've got any other great easy meal making systems or ideas!